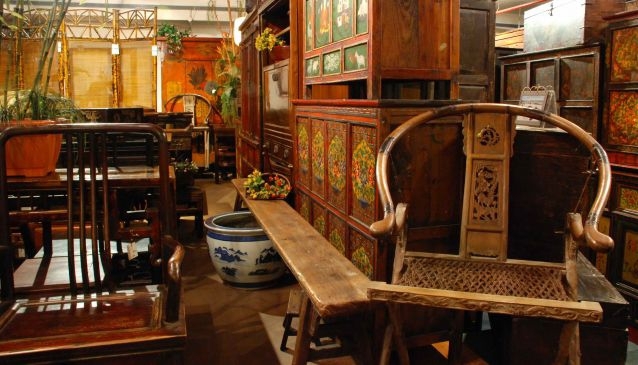 On the 7th floor of an industrial building, well off the beaten track among mechanic and manufacturing shops, there's a hidden gem for Chinese antiques and furniture from Tibet: Li Bai Arts & Antiques. The owner of the premises, Linda Lee, is a seasoned collector who has a fascination with China. For her, Li Bai Arts & Antiques is not only a business but also the place where she can truly indulge her passion for distinct Chinese pieces. For over 16 years Linda Lee and her team of professional purchasers have been gathering antiques from all over China, going personally to some of the most remote places in the countryside. These wooden treasures and paintings are on average more than 100 years old and Linda enjoys sharing their story and how she saved them from being destroyed, sometimes getting them out of burning houses or retrieving them from the bin just in time. Once in possession, the pieces are sent to the restoration centre located in Southern China, where only traditional techniques of restoration are used to rejuvenate and unveil their fine artistry and unique character. The uniqueness of the shop is its amazing collection of Tibetan pieces of furniture, certainly the widest that can be found worldwide in terms of quality and range. With their elaborated designs and rich colours Tibetan chests, trunks and reading tables are particularly stunning. Li Bai Arts & Antiques also proposes an interesting offering of decorative arts, such as carved panels, ancestral paintings, Thangkas but also all kind of elaborated Chinese baskets and coveted lattice window and door screens. If you're visiting Singapore, all these marvels can be easily sent home through Li Bai's professional oversea shipment service. If you already own a Chinese antique furniture or art work that needs to be restored, Li Bai Arts & Antiques will be able to help even with the most delicate items such as terracotta figurines and Chinese ceramics.